The severe lack of sun and central heating always makes my skin look a bit dull and lackluster in winter. Thankfully, help arrived in the form of Rosa Camelia Face Oil (thanks Clemency!). Made in small batches in New Zealand, this artisanal face oil is a superb do-it-all. It’s immensely satisfying to apply, owing to its lovely rose scent, which really lifts the spirits (and senses) after a long and tiring day. Made with a luxurious blend of 10 oils, this velvety elixir blankets the skin in a rose-scented veil of hydration. 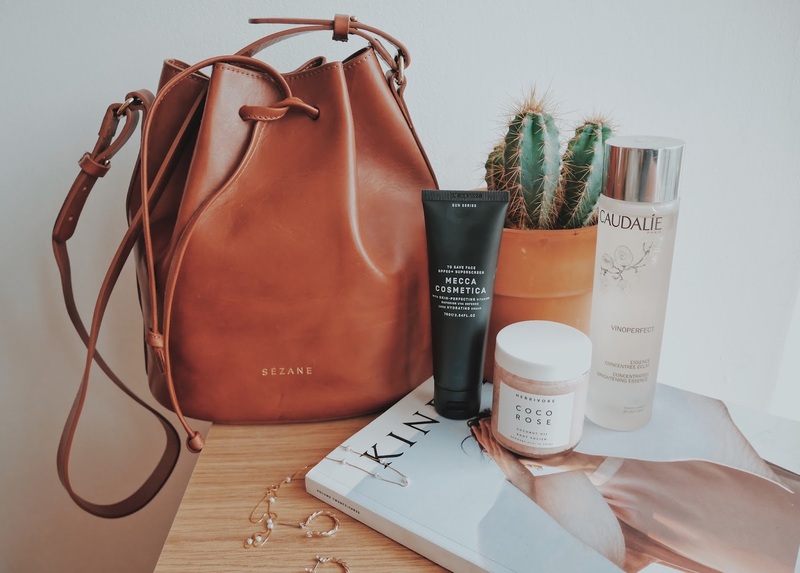 I’ve been using it for a little over two months and I must say that I'm truly smitten – it can be mixed into foundations, serums and liquid highlighters for extra glow and a boost of moisture. Unlike most oils, it has a lightweight consistency and sinks into the skin swiftly. It even sits beautifully under makeup. Don’t be fooled by the minimal packaging and the diminutive size, the golden liquid it contains is a total skin treat! Discover more about this gorgeous oil and Clemency's incredible ingredient-lead skincare range here. One of my main skin concerns is the pigmentation and dark spots around my lips and chin. By making chemical exfoliants and sunscreen the mainstay of my skincare routine, I’ve started to notice some improvement. If there’s one product that’s truly made a difference, it’s the Concentrated Brightening Essence from Caudalie. It’s chock-a-block with ingredients that are known for their texture-improving and brightening qualities, namely glycolic acid. I like the fact that it gently resurfaces the skin while leaving it smooth and bright. I use this exclusively at night after a thorough double cleanse and follow it up with the Caudalie Vinoperfect Radiance Serum (another fave for combating pigmentation). I pour a few drops of the essence onto my palm and pat it into the skin as it feels quite cooling and immediately makes my skin look all soft and plump. I’m a bit on the fence about eye creams because I know for a fact that they can’t really ‘erase dark circles’. But they certainly do help with other issues such as fine lines and puffiness. So, with that in mind, and also egged on by the fact I’m now on the other side of 30(! ), I reluctantly started to use the Brightening Eye Cream by Instytutum. What drew me to this eye cream is its velvety and lightweight texture – it feels lovely and cosseting without being too heavy for the under-eye area. Despite the creaminess, it doesn’t interfere with makeup and I’ve found that my concealer sits much better when layered over this. My verdict? Still undecided, but they make my eyes look less knackered and that's all that matters, isn't it? I go through these phases where I’m obsessed with certain products and can’t stop using them. Last month, I was seriously crushing over the Tom Ford bronzer in ‘Terra’ and this month, my attention has shifted to this wonderfully hydrating serum. I’ve long been a fan of Caudalie and their gentle yet effective formulations but the Vinoperfect Radiance Serum is undoubtedly the star of their range. It’s jam-packed with skin-benefitting ingredients, such as moisture-boosting squalane and radiance-enhancing grapevine shoot extract. I absolutely love the lightweight, milky consistency and how easily and effortlessly it sinks into the skin. I’ve gone through an entire bottle in just one month and that’s a testament to how much I love this! I don’t really like watery serums and this took a while to get used to. But I’m glad I persevered and continued using it as it works brilliantly to boost moisture levels in the skin. I noticed an immediate improvement in my complexion, thanks to the presence of Sodium Hyaluronate so high up on the ingredients list. This lightweight serum also has a host of humectants and plant extracts to deliver a jolt of refreshing moisture. It has a thin, gel-like consistency that doesn’t feel like much on the skin but its magic lies in its power-packed formulation. Also, my husband R, who has severely acneic skin loves this, as it’s fragrance-free, doesn’t irritate his skin and feels moisturising enough on its own. If you’re a K-beauty obsessive, you’d know by now that this enjoys a cult-like status in the beauty world. This serum-oil contains a concentrated version of vitamin C – which is the gold standard for brightening and whisking away any dullness. It’s a dry oil, which has a slight warming sensation when patted into the skin. Due to its oily consistency, I’ve only been applying this at night and it has helped a lot with my pigmentation issues. I have some stubborn sunspots and discolouration around my mouth, and whilst it hasn’t completely disappeared, it has started to fade. This squalane-based oil is an absolute sensorial delight to use – I love massaging it into my face every night. Made with a blend of jojoba, olive, argan oils, it feels absolutely luxurious and the heady scent elevates the whole routine. On days when I feel like my skin needs a pick-me-up, I apply a generous layer of the oil and massage my face with a jade roller. I understand the amount of essential oils in it might ring alarm bells for those with sensitive skin, but my dry skin laps it up. I don’t know if it makes any real difference to my skin apart from providing a good dose of moisture, but I continue to use it just for the experience alone. The first time I stumbled across Jasmine Garnsworthy’s Instagram, I was awestruck by her effortless Aussie-girl style and her glowing skin. Little did I know that the secret behind her radiant complexion was her all-natural skincare line – It's The Buff. The premise is simple – they custom blends oils to suit customers’ specific skin concerns. Simple yet ingenious, isn’t it? I told them I had normal-ish skin that vacillates between dry and dehydrated depending on the weather and they concocted a golden elixir, made up of just two cold-pressed oils – jojoba and rosehip. Both the oils are great for boosting moisture levels and also act as an anti-inflammatory agent to soothe and nourish weather-stricken skin. They also take the personalisation game one step further by stamping your initials onto a generously sized 120ml bottle – very insta-worthy (geddit? ;)), don’t you think? Niod, as a brand, somehow never appealed to me – until I read this thorough and detailed review by Detail Oriented Beauty. Whilst I appreciated their science-backed formulations and bs-free messaging, I couldn’t get my head around their sciency-sounding product names – thankfully Arly has done a brilliant job of explaining it all in her comprehensive review. Clearly swayed by her glowing review, I placed an order on Victoria Health. Two months on and an empty bottle later, I totally understand the hype surrounding this beautifully formulated serum. Packed with 15 forms of hyaluronic acid, the lightweight liquid hydrates, plumps, soothes and leaves the skin feeling cossetted and comforted. I call this my skin whisperer! 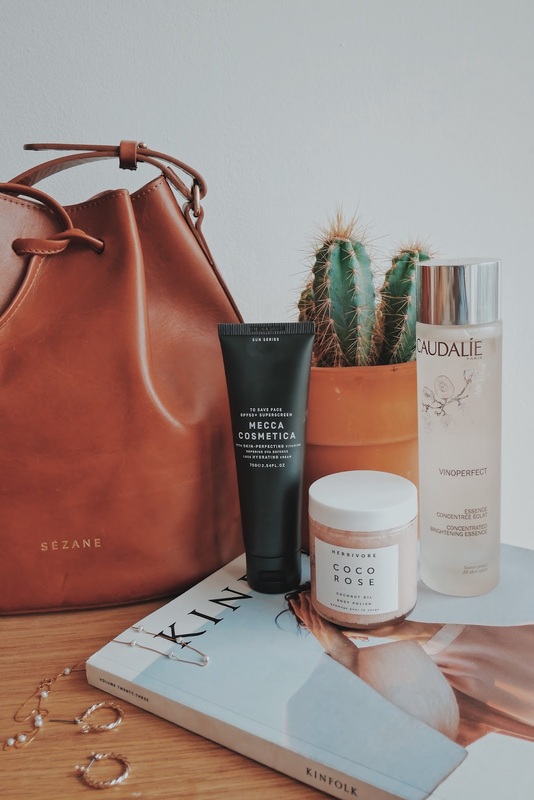 I feel like it’s been a while since I’ve sat down and spoken about any of the new additions that I’ve been enjoying lately, so thought I’d chat you through five of my newest beauty and fashion favourites. So, let’s get started, shall we? 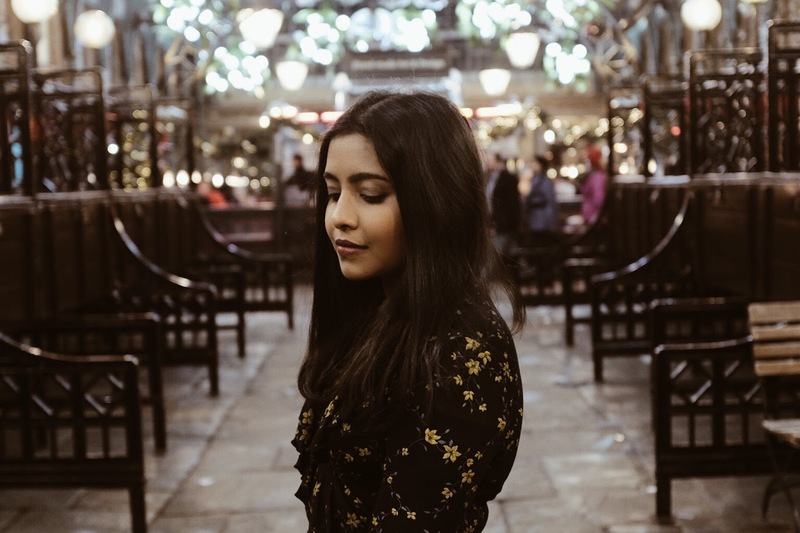 Since I hail from a sun-drenched country like India, I go into complete disarray about what to wear during these unpredictable transitional months. After being swathed in thick woollens for the better part of the year, I eagerly look forward to working light, fluid layers into my wardrobe. So, when I stumbled across this cheery yellow blouse from Glassons during my holiday in New Zealand, I knew I had to buy it. My friend S and I went on a little shopping spree in Christchurch and we loaded our baskets with tons of pretty floral dresses, wrap blouses and culottes (much to the dismay of our husbands). I particularly love the flattering silhouette of this blouse and how it flares out at the waist. During the aforementioned shopping spree, I made a quick pit stop at Mecca Cosmetica to buy their award-winning sunscreen. I’ve used the Neutrogena Dry Touch Sunscreen for as long as I can remember and I felt like I needed something lighter for summer. Though I like the Glossier Invisible Shield, the diminutive size makes it impractical for daily use – I went through an entire bottle in one month. To Save Face Superscreen from Mecca has factor 50 sun protection and a light, silicone-y texture. I haven’t used it long enough to see how it truly performs but it sits well under makeup and glides on fairly easily. So far, so good! Here, take a cushion and make yourself comfortable… this is a long one, so grab a cuppa, maybe? R, being the darling that he is, wanted to buy me a memorable birthday present, but he couldn’t figure out what I wanted in spite of asking my friend K to do some spying work. So, on a grey morning in March, just a few days before my birthday, he asked me what I wanted. I ummed and ahhed and decided I wanted the Farrow bag from Sézane. As luck would have it, this shade (Smooth Chocolate) was sold out, so he ordered the navy one and it came in a day after my birthday. But, he wasn’t convinced, because he knew my first choice was the lovely tan shade. So, he wrote them mails, bombarded them on social media and checked the website every day to see if it came back in stock. Though I assured him that I was happy with the navy version, he wasn’t fully convinced. Finally, a day before we went away to New Zealand, a small stock of the bag was released and he managed to place the order just in time before it sold out again. Phew! Thank you so much R for always going out of your way to make me happy. 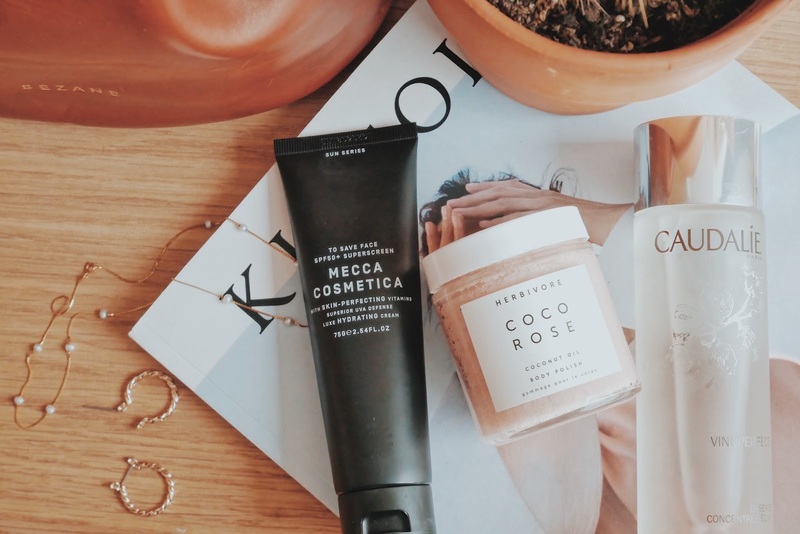 This body polish from Herbivore smells like coconuts and rosé – two of my favourite things. Whilst the packaging is high on instagramability-factor, I like the fact that it performs just as well. Recently, my skin has been feeling particularly dry and flaky, so I’ve been using this body polish every other day to get rid of the bumpy bits. I‘ve noticed a massive improvement in the texture of my skin and my legs no longer look dry and scaly. It’s truly a miracle! I like the fact that it’s gritty without being abrasive and the coconut oil in it provides a good hit of hydration. It’s a lovely precursor to spring. I never knew I needed an essence until this worked its way into my routine. I’ve been using this for a little over a month now and I must say that it has an instant quenching effect on the skin. The consistency of this is lighter than a serum but it’s power-packed with a host of ingredients to back up its brightening claims. I typically use this at night after I’ve thoroughly cleansed my face and I follow it up with a bevvy of serums and oils to lock in the moisture. I don’t usually share anything personal on the blog here and I thought I’d start the New Year by giving you a little peek into the recesses of my mind. I came across this brilliant article on Bianca Bass titled ‘21 Questions to Bring You Closer to Who You Are in 2018’ and I thought I’d answer a few questions from it – it definitely made me think hard and helped to crystallise some of the things I’ve been pondering about. Looking back on the past year, when did you feel most alive? When I’d put on my running shoes, plug into a podcast and go for a run in the park. Though I started doing it in a bid to get healthy, I slowly began to enjoy it and saw it as a way to decompress. I loved pushing myself and setting new targets every week. By the end of summer, I could run a whole mile without stopping to catch my breath and that’s something I thought would never happen. While I know it’s mostly down to the serotonin-fuelled high, I felt completely centred, happy and alive after a good run. What is your definition of feeling ‘alive’? It’s all about feeling one with myself - if that makes sense. It’s like a euphoric high that you experience when you feel centred and balanced. What does your ideal Sunday look like? Long lie-ins, a good hot bath, and cooking up a storm in the kitchen. Who or what are you most inspired by? Why? I draw inspiration from everything I see around me. Sometimes it’s an image that triggers an idea or sometimes it’s a string of words that gets the creative juices flowing. To be honest, it’s the mundane-ness of every day that pushes me to be creative and that’s my biggest motivation to do something. Does that make sense? Hmm. This is a difficult one – I confronted a situation instead of running away from it. Does that count? Not in a really long time. I’m a true Piscean – I don’t like to venture into uncharted waters. If your life stopped today, what would you regret not having tried? The idea of starting my own business has been simmering beneath the surface for a while now. R and I have been discussing it and I have a strong gut feeling about it. While I lack a clear vision as to what I want to do, I know that I want to start something of my own. So, I’d be very disappointed if I didn’t get to do that. When you’re alone — truly alone, with no phone, no book, no noise, nothing — how do you feel? What does the silence feel like? Restless. We are so attuned to always be busy that I find it hard to switch off. But, it’s my mission this year to make silence my friend. I want to embrace the quiet moments instead of reaching for the phone. How do you respond when you don’t get what you want? I’m a very safe player in life. I’m very cautious. I always weigh out my options before doing anything. I don’t take too many risks. I always set my expectations very low so as to not be very disappointed. But if something didn’t go my way, I’d pick myself up, and give it another go. How do you respond to situations that force you to get out of your comfort zone? Though it usually starts out with a little resistance, I always adapt to it quicker than I think. What area of your life, right now, makes you feel content? What area makes you feel anxious or confused? Why? While most aspects of my life have some semblance of balance, it's my professional life that I feel uncertain about. The confusion mostly stems from the fact that I want to do more in life. I don’t want my 9-to-5 to be the sole defining factor in my life. I want to do much more than that. I want to be creative. I want to be involved in the process of creating something. Like I’ve mentioned above, I want to start a business of my own and not having a clear vision is definitely making me feel a little unmoored. While last year was all about pushing myself out of my comfort zone and asking the difficult questions, I want this year to be about revelling in the little moments. I want to slow down. I want to stop multitasking. I want to dedicate my full attention to what I'm doing rather than trying to balance many things at once. If I'm having a bath, I want to enjoy the feeling of warm water cocooning me, rather than staring at the screen of my phone every few seconds. If I go for a run, I want to let my thoughts take over me instead of trying to drown out the noise with music. If I'm reading a book, I want to completely lose myself in it. I want to infuse life into everyday routines. I want to delight in the feeling of doing nothing. I want to stop confining myself to the claustrophobic boxes of my to-do lists. I want to take better care of my mental and physical health. I want to nourish my body from within and out. I want to stop feeling like I always need to be busy. I want to press pause, take a deep breath, and let go. 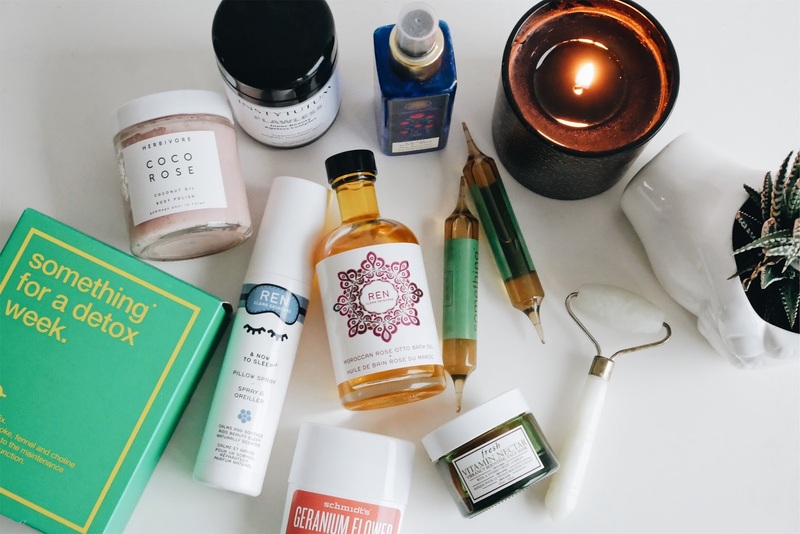 To help me in this mission of trying of embrace a slower and more mindful pace of life, I've rounded up a few products (some new and old) that support a happier and healthier mind and body. One thing I'm actively working towards is trying to use more natural and cruelty-free brands and Ren makes up about 50% of my skincare and body care. Their chemical-free formulations, striped-back-yet-chic packaging and their environment-friendly ethos are totally on point. While I have a long list of favourites, my top recommendations are the incredibly luxurious Moroccan Rose Otto Bath Oil and the newly launched & Now To Sleep spray. Most pillow mists are made up of lavender but the addition of ylang-ylang and frankincense makes it smell altogether more luxurious. I've definitely noticed an improvement in my sleeping pattern ever since I started using it and like I've mentioned here, it has an instant calming effect on me. I'd go as far as to say that it's truly transformative. I've always wanted to use a natural deodorant but didn't know if it would work and so it never quite made it into my beauty regime. But after reading some great reviews about the Schmidt roll-on sticks, I thought I'd give it go. And I'm happy to report that it's totally blown me away. To begin with, I'm not someone who sweats a lot, so it didn't have a lot to do. I just wanted something that kept my underarms smelling fresh and didn't leave those telltale white marks and it worked brilliantly on both these counts. It has a slightly waxy texture that melts into a soft oil-like consistency, which surprisingly feels nice and light on the skin. Talking about body care, it's an area that we generally tend to scrimp on. It's easier to use a bog-standard drugstore body wash or a scrub. 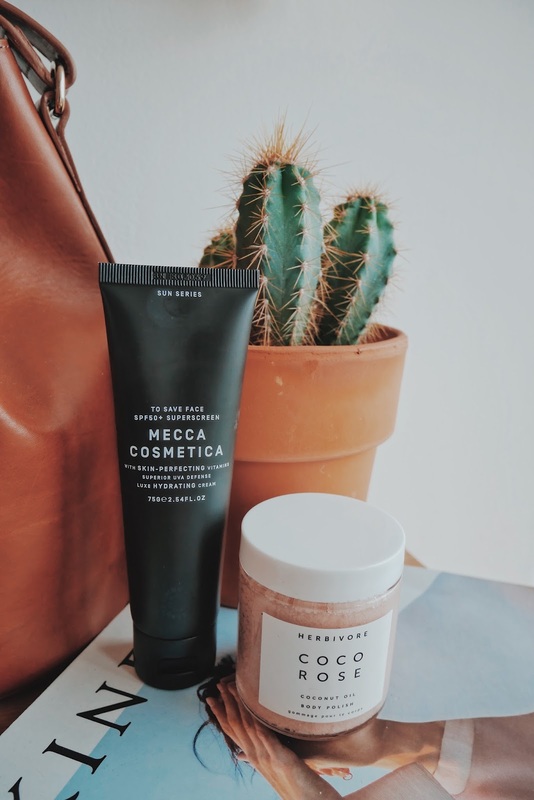 While I'm still looking for a body wash that's free from chemicals and doesn't cost a mini fortune, I've fallen head-over-heels in love with the Herbivore Coco Rose Body Polish. Apart from its very appealing millennial-pink hue, its tropical-scent makes me think of warm sunny days on a beach. It's gentle but effective and gives a good buff while leaving the skin feeling thoroughly moisturised. I discovered the Forrest Essentials Rose Mist on my last visit to India and it's a high-end, luxury brand with products formulated around ayurvedic principles. Coupled with beautiful packaging and gentle formulas, their products all naturally fragranced. This refreshing mist smells exactly like freshly cut roses and I'm on my second bottle at the moment. I've had the jade roller for a while now and I love giving myself a massage every now and then. I slather on a generous layer of oil and go over my face a couple of times. Apart from aiding with lymphatic drainage, it's incredibly relaxing. The Fresh Vitamin Nectar mask is a new addition to my skincare arsenal and it's slowly worked its way to the top of my favourites. It has an instant brightening effect and leaves the skin feeling so soft! I'll report back on this once I've used it a couple more times but for now, I think it's a gentle exfoliating mask. One of my resolutions is to start taking better care of my health. So, I've started taking the Instytutum Flawless Inner Beauty Ageless Complex capsules. While it's hard to notice any discernible difference, I know it's going to help in the long run. It’s packed with a host of skin-benefitting ingredients like biotin, which helps to strengthen hair and nails, while selenium is a powerful antioxidant that prevents cell damage and increases skin elasticity and the famed hyaluronic acid boosts collagen production. It’s so hard to find one supplement that does it all and this one features the most comprehensive list of ingredients I’ve ever seen. Quite impressive. 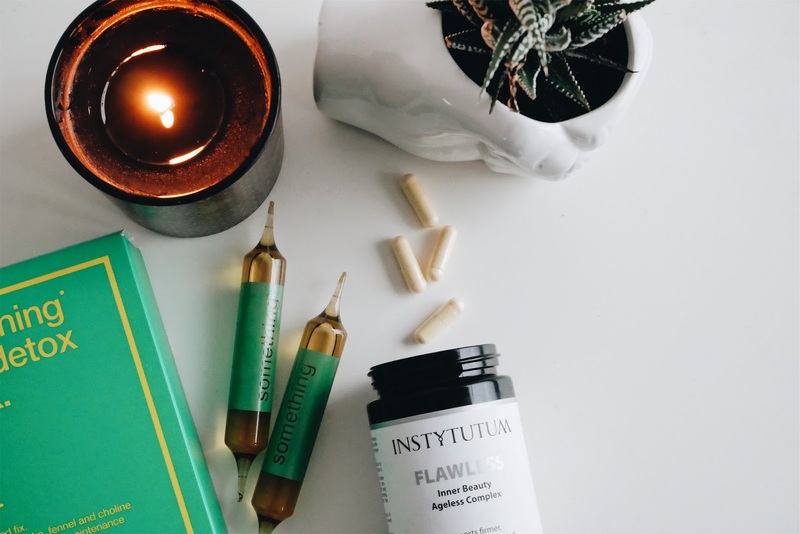 I could go on awhile about its brilliant formulation, but Instytutum does an excellent job of detailing the ingredients and how it works right on their website. The Something For A Week kit from Biocol Labs is a plant-based detox kit that I'm quite excited to try. It contains a purifying blend of chicory, artichoke and choline, which contributes to the maintenance of a normal liver function. It comes with seven ampoules that can be taken on its own or mixed in with a juice. They suggest doing one detox every month and I'll do a detailed post about it soon. December has been an incredibly busy month for me. From endless work deadlines to hosting my very first Christmas party, it's been crazy, chaotic and downright exhausting. Thankfully, these products have been my perfect pick-me-ups during this busy festive period. Becca Blacklight Priming Filter// My skin's been looking a bit lacklustre lately and this luminous primer has been my ultimate saviour. It feels lovely and moisturising and makes skin look instantly more awake. I usually mix it in with the Glossier Priming Moisturiser for an extra bit of glow and hydration. Tom Ford Beauty Shade & Illuminate (Scintillate)// This was one of those PMS-fuelled impulsive buys that I thought I might regret, but surprisingly it's been one of my most used cheek products in the last month or so. It's lightweight, silky and imparts a sheer tint of colour. I like formulas that don't set on the skin and this beautiful blusher-highlighter duo retains its dewy shine without fading away. It really is an investment worth making. And I don't say that lightly. Jilian Dempsey Lid Tint// I found this while scouting for a Secret Santa pressie at Topshop. I might have done a little happy dance because this has been on my wishlist ever since I saw Lisa Eldridge use it in this video. If you've read this post, you'll know that I love a good glossy eye and this is the perfect product to achieve that look. Creamy and waxy, this eyeshadow imparts a beautiful radiance to the eyelids without looking like an oil slick. Though the texture is lightweight, there is a slight tackiness, which some might find annoying, but personally, I don’t mind. NAF Cuticle Oil (Juicy Mango)// I have Sahara-dry hands and my cuticles look more unsightly than ever during winter. To stop them from peeling, I've been brushing this oil over my nails every night and they've made a huge difference. Vegan and cruelty-free, it features a mix of Vitamin E, jojoba and mineral oil to nourish, hydrate and strengthen the cuticles. L'Oreal Nail Polish (Rubis Folies)// I don't usually wear bright nail colours, but recently I was overcome with this urge to find a particular shade of red. I wanted a cross between ruby red and raspberry and Rubis Folies from L’Oreal seemed to perfectly fit the bill. It's a gorgeous claret hue and it feels less in-your-face than a true red. I've been wearing this all of December and I've got tons of compliments, which leads me to believe that it's a pretty unique shade. Also, I was pleasantly surprised with the formula, it's creamy and delivers rich, pigmented colour in just one coat. Top marks all around! Nuxe Huile Prodigieuse// I'm extremely lazy when it comes to moisturising my body, but this dry oil makes it a quick two-minute affair. One of the problems I have with using a body oil is that it leaves behind a sticky film but this one from Nuxe sinks in quickly while eliminating the uncomfortable over-lubricated feel. Apart from being deeply nourishing and hydrating, it smells absolutely lush, too. REN & Now to Sleep Pillow Spray// The first time I used this sleep-inducing spray, I didn't notice much difference but after prolonged use, I can say it works brilliantly to calm my busy mind before bed. Formulated with calming ylang-ylang, frankincense and lavender, it smells incredibly lovely and relaxing. Also, how cute is the packaging? Escentric Molecules 01// Much like finding the perfect pair of jeans, finding your signature scent can be a bit of a task. However, I can safely say I've found my signature scent in this fragrance. It's musky, woody and transforms into something infinitely more sultry on the skin. It's also the only fragrance I've ever worn that routinely has people coming up to me asking what I’m wearing. And that rarely ever happens in London, so that’s saying something.